Alev Karagulle at Burgess tells me of a €1 million price reduction on the 46m motor yacht Mystic, a joint listing with bluewater in France. Built by the CMB shipyard in Turkey in 2010, Mystic has exterior styling by Diana Yacht Design and a stylish modern interior created by Schnaase Interior Design. She is fitted out with top brands throughout, including Swarovski crystal lighting, Ralph Lauren furniture, Miele domestic appliances and a Furuno navigational suite. 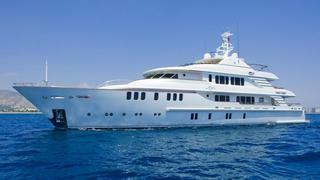 Accommodation is for 10 guests in 5 cabins configured as a vast master suite, 2 doubles and 2 twins. Special features include a dedicated cinema/media room and a large fully equipped gymnasium with sauna and shower rooms. Her expansive sundeck offers a large jacuzzi, integrated sun loungers and a bar area. Twin MTUs deliver a cruising speed of 13 knots, a maximum speed of 16 knots and her range is 4,000 nautical miles at 12 knots. Built to RINA Class and fully MCA LY2 compliant, Mystic offers the ideal turnkey solution for a private or charter buyer, now asking €14.995 million.